As a visual artist, Friedemann-Sánchez works in many forms, representing different voices and stories. Earlier chapters feature carved wood and textiles, and one of the center pieces of this show include lace, large Tyvec sheets painted with India ink, and images inspired by traditional Latin American art. For Friedemann-Sánchez, telling different stories visually means working in different forms, which presents many challenges for the artist. 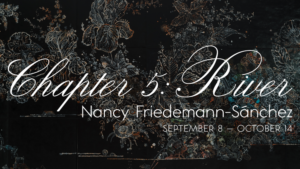 Chapter 5: River, will open at the Union for Contemporary Art in North Omaha this Friday, September 8 at 6pm and show until October 9. On Saturday, September 9 at 2:00pm, UNO Professor Claudia Garcia will join Friedmann-Sánchez for Artists in Conversation, a discussion of the exhibition. For more information, visit U-CA.org.